A Screen frame take quite a beating as the years go by. Window screens for residences are only made from thin aluminum and if you remove it for cleaning two or three times a year, there’s a good chance it will eventually get damaged from all the handling. Sometimes it’s possible to repair a frame if the only problem is just a bent rail. 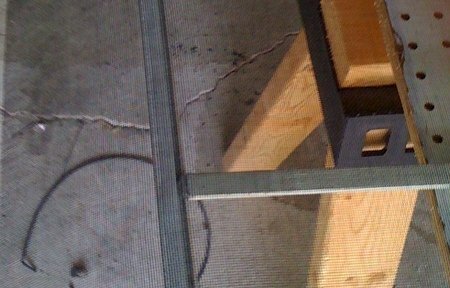 To fix a screened frame with a bent rail you will need to pull the spline out and pull out the screen cloth from the rail that is bent. Stand the frame up vertically with the bent rail down on a table top so you can see how much you have to bend it to get it straight again. Grab the top and the bottom of the bent rail and push on something solid where the rail is most bent. A little trial and error and you will have the frame straight again. Just do not push too hard, window frame bars are easy to break ! One common problem with screening very tall frames is that when you roll the screen cloth in, the frame gets bowed in the center as the picture above shows. You can avoid this problem in a few different ways. One way involves installing a divider bar. The divider bar works but not everyone likes to have a bar across the middle interfering with the view through the screen. So the next thing you can try is "cambering" or "bowing" the screen frames. Screenbar manufacturers usually put a slight bend in the bars so that when you roll the material in, the bars will pull straight. Bars are very easy to bend by hand, especially long ones. I usually bend them by pushing them in the center with one hand above and the other below, against the edge of the table. Hardly any force is needed to bend them 1/4" or more. Too much though and the bars will bend beyond repair. You can also use commercially available blocks that attach to the table to push against. These have the advantage that you never have to lift the screen bar off the table. Metal door and window screens are most often made from thin aluminum. The strongest window screens for residences are made from extruded aluminum which is usually quite thick and resistant to bending. Extruded aluminum frames are usually staked together at the factory so if they do get bent, its not so easy to take the frame apart. But it is still possible to remove the bent rail and straighten it, using the method I just described. Extruded aluminum metal door and window screens are staked together by inserting an aluminum corner and using a hammer and a metal punch to force a small amount of the frame material into a recess in the corner. If you want to repair a bent extruded aluminum frame, you need to drill through the little indentations you see at the corners. Usually four per corner. Then flip the frame over and drill out the corresponding four holes on each corner on the opposite side. Then you remove the spline holding the cloth on the bent rail. 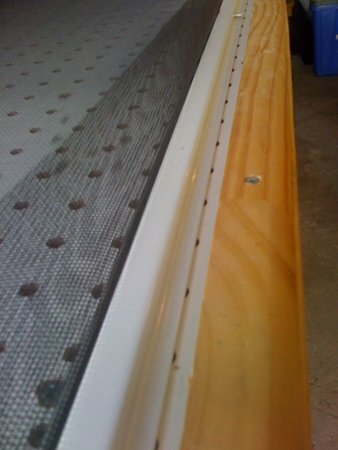 You carefully lift the screen cloth out of the channel and pull the bent rail out. If the cloth is aluminum in your metal door and window screens, you will have to remove all the cloth, whether it is damaged or not. Most window screens for residences use fiberglass cloth, and if it is in good shape, it’s likely you can roll it back in after repairing the bent rail. Aluminum cloth cannot be rolled back in. After removing the cloth from the bent rail, pull the rail out of the frame by gently pulling the corners apart with your hands. It should come apart very easily if you have drilled through all the places where the corners were staked together. To bend the rail straight you need to clamp it in a vise and bend it back into shape by hand. Some extruded aluminum frames are very strong so you need a solid place to clamp them so they don’t spring back and injure you while you are trying to straighten them. Most screenframes used for residences are made of roll-formed aluminum which only uses friction fit aluminum corners to hold the corners together. Fixing a bent rail in one of these window screens is much easier. Locate the bent rail and pull out the cloth on that side as just described. 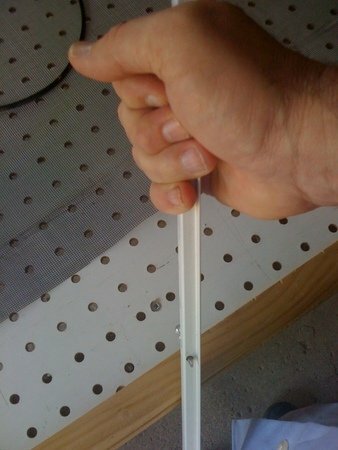 It should be quite easy to pull the bent frame rail away from the corners with your hands. Roll-formed aluminum is much easier to straighten. In fact it’s so easy to straighten that you could easily use too much force and break the rail in half. Bend it back into shape gently and carefully. After getting the rail straight, install it back into the frame. If it’s an extruded aluminum rail you will need to get a hammer and a pointed metal punch and make indentations in the corners to lock them together again. 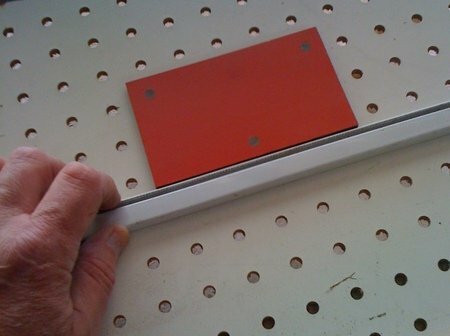 With a rollformed aluminum rail the friction of the corners holds the frame together. With a bit luck you should be able to roll the old cloth back in so long as it is made of fiberglass. The old cloth may stretch enough although it is possible that rolling in the old cloth will bend the rail out of shape again. If that happens pull out all the cloth and rescreen the whole frame.